This spring there has been more gardening done around my house than ever before and it’s awesome! Plans for the vegetable garden went underway at the beginning of the year. There was great anticipation for fresh cucumbers and tomatoes, and less trips to the grocery. I am just now, late May, starting to be able to harvest a few things, such as lettuce and spinach. It has been a cool, rainy spring until just this week, when temps are now getting into the mid and upper 80s. It was rather hard to get some of the seeds to germinate, especially the green beans and tomatoes. The area behind my barn used to be all grass until a couple of months ago. A 8’x12′ plot was stripped of its sod, a gutter installed on the shed, and a rain barrel added. Fencing to keep the dogs out, metal edging to keep weeds from growing in, and a Mondrian inspired trellis for the melons, green beans, and cucumbers. The rain barrel filled quite quickly with the copious amounts of rain we’ve had over the past month. Now, it’s been over a week since rain we had a big increase in temps. With the back side of the roof’s surface area on the 8’x12′ shed, the rain barrel can be filled with about 1.5″ of rain. I’ve watered my garden nearly everyday for several weeks and just now the barrel is getting low on water. I put a little bit of different types of things in the garden so I’d have a consistent supply of things to harvest. Kohl Rabi, Sunflowers, Calendula, Sweet Basil, Cinnamon Bail, Siam Basil, heirloom tomatoes, zucchini, cucumber, leeks, onions, radishes, spinach, salad mix, kale, broccoli, carrots, orange melon, watermelon, green beans, chives, oregano, parsley, and a strawberry. It has been a slow start because of all the cool cloudy weather, but things are beginning to really take off!! The fresh strawberries have been so wonderful. A couple of weeks ago, my man surprised me so much with some native shrubs for my garden. It has been really fun to see how they’ve budded out like crazy over the past couple of weeks. 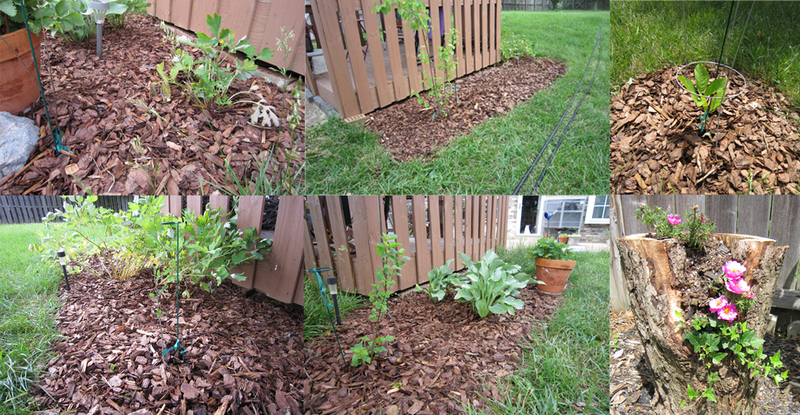 Of them, was a Fringe Tree (top right), which I planted in the middle of the backyard. Their spread is about 30′ wide and tall at their maximum potential. There is an Arrowwood viburnum (top middle), which the native Americans would make arrows out of. There is also Sweet Shrub (top left on the left side of photo). This has been a tough one to keep going. With the sudden heat this week, the leaves have begun to wilt, even with watering everyday. I hope once its roots are better established and it gets acclimated, it will send out new buds. Spice bush (bottom left) will attract the Spicebush Swallowtail once it blooms. It will be incredible to attract such a butterfly! The two Ninebarks (bottom middle) have taken extremely well and one even has a small flower. I cut out all the beds around the gazebo where there is quite a bit of shade. These plants are understory shrubs which like mostly shade. I filled in spots will some shade plants from my mom’s garden such as Hosta, Woodpoppy, and Bleeding Hearts. I was also given a hollowed out tree trunk (bottom right) which is a great habitat for insects. I have plans to cut out more sod throughout this summer to make some nice beds around the house and patio. I have been really excited to add a diversity of plant life around the house and to think up some designs!